The Million Dollar Challenge is the show that gives PokerStars players in the US and Canada a shot at playing on national TV for $1,000,000 - and you can win your seat for free. There are freeroll qualifiers running online at PokerStars now, giving you the chance to make it to Los Angeles to play heads-up against Daniel Negreanu, and other top name pros and celebrities for one of the biggest prizes in poker. Season 1 proved to be the most popular poker TV show of all time, with millions of viewers tuning in to watch online qualifiers compete against Daniel and other Team PokerStars Pros like Vanessa Rousso and Chris Moneymaker. 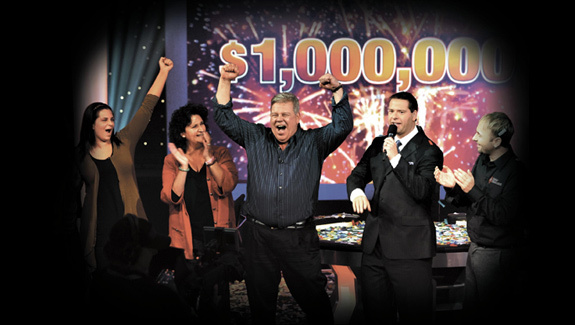 New Yorker Mike Kosowski won the $1,000,000 first prize after beating Daniel in the final match and it changed his life forever. Do you have what it takes to face-off against the biggest names in the game and walk away a millionaire? It’s time to find out. Download the free PokerStars software to get started, and check out the How to Qualify page to find out how you can enter for free now.